As I was heading north, I realised that it was the Women’s World Cup final between England and New Zealand. I had just got into the Arctic Circle, in the village of Jukkasjärvi in Sweden and wanted to know the score. So I thought a hotel would be a good place to find basic information. I went up to this hotel made of ice and knocked. No one answered. In fact I couldn’t even find a door. It just seemed to be ice rooms with not an internet connection, television or kettle within. So I continued heading north. I then came across an Arctic cat and asked him the score. Cats are very wise, especially in the Arctic. It may be because he spoke Swedish and not English, or most likely because he clearly wasn’t that bothered, but he didn’t help either way. He just continued looking at the ice. 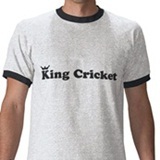 Email your match reports to king@kingcricket.co.uk and remember – strictly no cricket. Top report, DC. In fact, Top-of the-World report, one might say. Ha ha ha. Ha. Sorry. You know when you come back from somewhere, don’t you hate it when people ask inane questions despite you having showed them photos that combined with even one atom of common sense effectively answer the question they are asking? Disappointed that you didn’t think to take a cricket bat with you D Charlton, in order to shoehorn this into a third category. Is the divine cat was looking indifferent as it was ignoring your sled team of huskies? You disgust me, Ceci. You attempt to correct youre grammer yet fail to capitializificate youre name. The north is always cold. And i forgot my bat. Reminds me of a hotel on the Bolivian salt plains made entirely out of salt……..they didn’t know the cricket scores either. Gosh, is it really that light just a day or two after the equinox? Was it like the lights suddenly coming on being up there at equinox time? Or have I perhaps uncovered some temporal difficulties with your story with my incisive line of questioning? I wish you’d sneaked that cat home and given him to me. It is a splendid cat, isn’t it? I think it could be indifferent to absolutely anything. Ah – Ged Ladd – you pick holes in vain. I was genuinely heading north during the Women’s World Cup final and genuinely trying to find the score. I was told by the locals that we had just passed the time of year when they have more daylight than dark – sunrise and sunset were incredibly long, nonetheless. Cat is in the post Miriam – and the most amazing and splendid thing about this particular Arctic cat is that he was very thin – when you stroked him, your hand disappeared into the fluff entirely. Not that he noticed.